San Lorenzo Park is located in southern Monterey County, at the base of the Santa Lucia Mountains. Perfect for a day trip or for overnight camping, San Lorenzo Park has facilities for many outdoor activities, hiking trails and campsites. Visitors will also find the Monterey County Agricultural and Rural Life Museum in San Lorenzo Park. This museum teaches children and adults what it was like to live on local farms in eras gone by. Planning a day in the park? San Lorenzo Park has facilities for all kinds of outdoor activities. Show off your athleticism on San Lorenzo Park&apos;s volleyball courts and softball fields, and display more low-key sport skill at the horseshoe pits. Kids will enjoy San Lorenzo Park&apos;s playgrounds, and the whole family can wander the walking trails along the Salinas River. Take a break for lunch at the picnic areas, or settle down in the gazebo for a rest. Picnic areas for large groups are also available, so bring the extended family! San Lorenzo Park offers 83 RV hook-up sites, as well as areas for tent campers. The San Lorenzo Park campground includes restroom, shower and laundry facilities, Internet access, a putting green and group buildings available for rent. 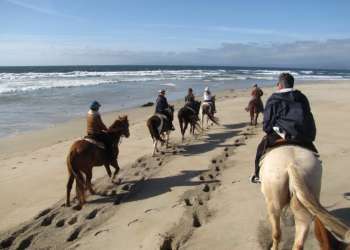 Visit the Monterey County Parks site or call 1-888-588-2267 for reservations and current fees. San Lorenzo Park&apos;s Agricultural and Rural Life Museum isn&apos;t just a building; it&apos;s an experience! It has a one-room schoolhouse, restored farmhouse, blacksmith shop and more! Visit our page on the Agricultural and Rural Life Museum for more information. From Route 101 North or South, take the Broadway exit. When you reach the intersection of Broadway and San Antonio (north of the highway), take a left-hand turn onto Broadway. The park is at the end of Broadway Street.